The big brother to the EDIX® Tiamo model. A superb choice for the rider who wants to enjoy long relaxed rides out or enjoys Western disciplines and training. By replacing one of the foam layers in the EDIX® MPDS structure with a 14mm felt, the Tequiro has its own individual structure and therefore the Tequiro is also very suitable for the heavier rider. The EDIX® Tequiro western saddles are available in the colors brown and black and in sizes small, medium and large. The use of strong quality Nubuck leather makes the complete EDIX® Tequiro treeless Western saddle look sturdier than its little brother, the EDIX® Tiamo model. The EDIX® Tequiro is a very solid and comfortable treeless saddle. The “v” girthing system of the EDIX® Tequiro Western saddle allows the girth force to interact across a larger area of the saddle, as the connections are fastened at the front and the back of the saddle, as opposed to in the middle. Furthermore, the position of the girth itself can be adjusted forward or backward. As such, only the weight resulting from the interaction of the rider will be at the centre point. 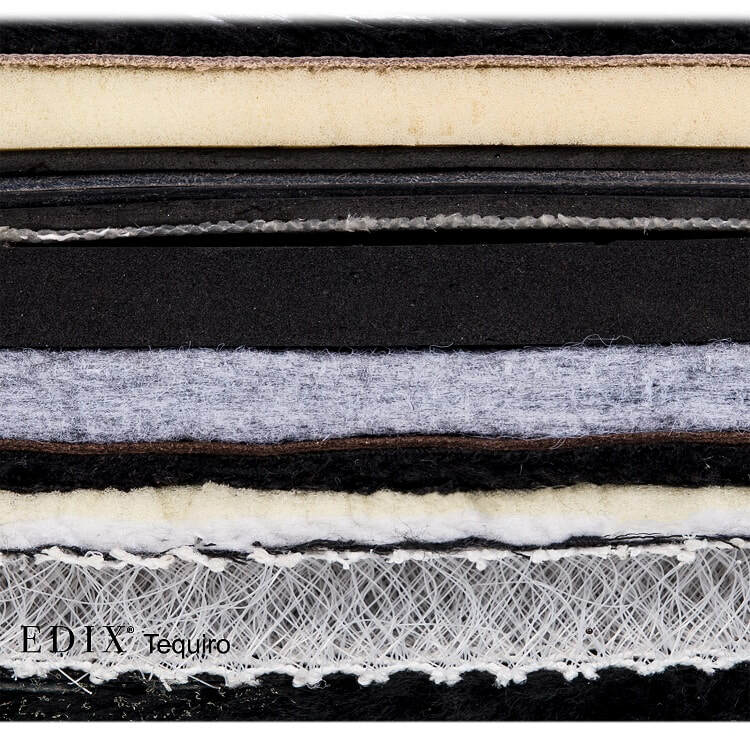 The EDIX® Tequiro as a complete combination consisting of a 2-part superstructure of high quality Nubuck leather and a substructure of an optional contoured felt saddle pad including 3 Mesh inlays. The optional leather fenders are adjustable with a blevin slide buckle and the leather covered stirrups complete the EDIX® Tequiro. A typical treeless saddle for the rider who wants to enjoy long relaxed rides out. Combined with an optional EDIX® seatcover made of Australian Merino® sheepskin for even more comfortable experience. 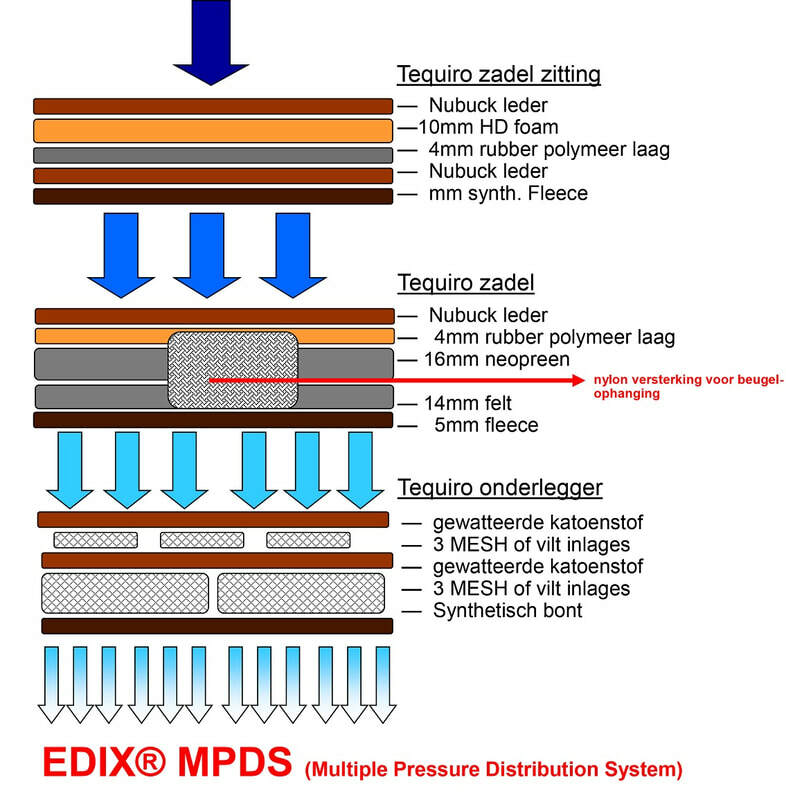 An EDIX® treeless saddle offers your horse optimum pressure distribution using the special layers of flexible materials: EDIX® MPDS, (multiple pressure distribution system). These soft, flexible layers adapt to the anatomy of the horse, as well as the rider’s posture. An EDIX® treeless saddle optimally reacts to the movements of the horse. Partly due to this, the rider learns to adapt to the horse’s movements and, as such, develops an independent position. As a result, the movements of the horse and rider become one, and from there, excellent communication is created. Because the horse is moving much more freely, it has the possibility to develop optimally, which is often shown by an increase in muscle mass. Due to the above and after the habituation period, both horse and rider, show in all aspect of horse riding more relaxation and more fluid movement. The pommel is interchangeable and therefore adaptable for a high or low withers. The pommel is made of fiberglass and the cantle is made of the soft material high density foam. They each link the left and right part of the saddle and together they offer stability to the saddle and seating comfort for the rider. By replacing one of the foam layers in the EDIX® MPDS structure with a 14mm felt, the Tequiro has its own individual structure and therefore the Tequiro is also very suitable for the heavier rider. The complete EDIX® Tequiro treeless western saddle has an optional matching felt saddle pad including 3 mesh inlays. A Neoprene layer is on top of the pockets either side of the spine, this neoprene layer provides additional pressure distribution, an anti-slip effect towards the saddle. The abrassive part of the Tequiro pad is reinforced with a suede leather. Due to its own specific shape and the beautiful materials used, the Tequiro saddle pad has a very refined look. If there is a preference for a more Western-like model saddle pad, a different saddle pad can be selected from the EDIX® universal Western pad range. There is the option to choose a felt or a foam quilted saddle pad with an underside that is finished with a synthetic wool or a Australian Merino® sheepskin. Each of these pads offers spinal clearance and are provided with pockets that can be closed with velcro, to which additional shims can be added. The Tequiro can be combined with the EDIX® saddlebags and breastplate, for which various rings have been fitted. The FRA® supergirth is optional and its 100% elasticity ensures a rock-solid fixation.